A few nights ago, the TCRPMG members had a model shoot in Hudson, NY. 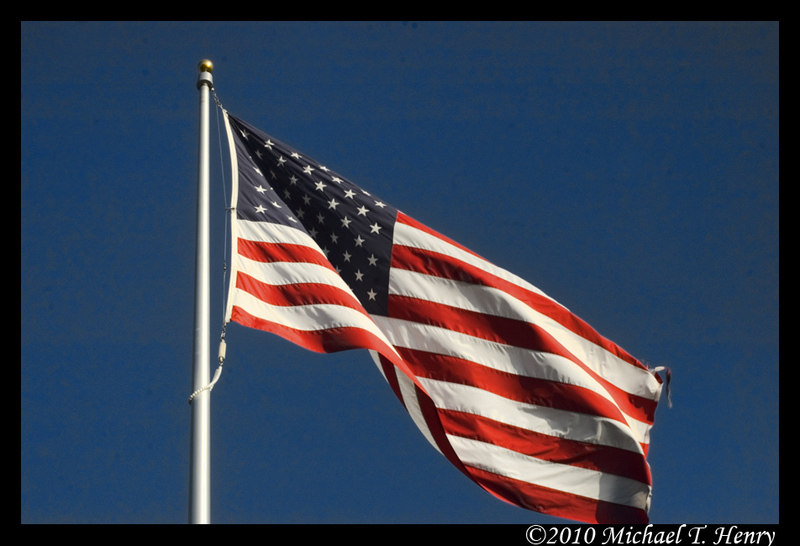 As we were shooting, my eye wandered up an enormous flag pole to see the flag among this gorgeous blue sky. I couldn’t help but shoot it. It was so gorgeous. You see, ever since I was a kid, I have been in love with the flag that represents this great country of ours. I always try to get good shots of it to share. That flag represents our freedom. That flag represents those risking their lives so we may keep our freedom. Many have given their lives for us. Unfortunately, a lot of people take that freedom for granted. Kristi was tweeting and talking on Facebook the other day about people that wouldn’t stop talking during the National Anthem. It made me pretty mad. I have noticed that people have become incredibly rude and just don’t care anymore. And it’s not only during the National Anthem. There have been a few instances where I was probably sitting in my chair with my mouth wide open, amazed at how rude people are. My cousin’s wedding was a great example. My cousin and his wife were at the altar and the priest was doing conducting the ceremony. There was a crowd of people in the back of the room that were carrying on a loud conversation. I was getting pretty angry. They were disrupting the service and didn’t even care. Last week, at Baseball and Bloggers, the panel was speaking and the people in the back of the room were so loud I could barely hear the speakers. It baffles me that this is becoming so common. Why would you go to an event and ignore the lecture just to chat with your friends? Pick up the phone and call them. Go to a bar. I know that I have no control over the way people act in public. I am just saddened by the lack of respect that seems to have become OK in society. What happened? I can only assume it’s because parents can’t (or wont) discipline their kids anymore. The world is going to be a very scary place in another twenty years. Now that my whining is over, I want to add one more thing. Find a Vietnam Veteran, an Iraq Veteran or a current military member and thank them for protecting this great country of ours. It’s because of them that we have the freedom we have. And don’t forget all of those that have lost their life fighting for us and those that are POW-MIA.